White paper on crime 2004 Part5/Chapter1/1. (1) Japan has been known as the safest country in the world for a long time.However,the country's crime situation has deteriorated rapidly over the last decade.Therefore,returning to being such country,in which the public can live with a sense of security,has become a critical issue.The White Paper on Crime had been analyzing the background factors for the recent increase in crimes with special articles entitled"Increasing Offenses and Offenders"in the2001issue,"Present Situation and Trend of Offenses of Violent Nature"in the2002issue,and"Changing Nature of Heinous Offenses and Countermeasures against Them"in the2003issue.Throughout these analyses,we pointed out that it was necessary for not only the criminal justice authorities and other relevant government agencies,but also for families,schools,workplaces,communities,and volunteer groups to cooperate beyond boundaries,offer opinions and make efforts to prevent crimes.We also pointed out that th e expected role of criminal justice agencies is to clear offenders swiftly and certainly and to impose strict but appropriate punishment upon those offenders who have committed heinous and serious offenses. (2) However,the roles of the criminal justice agencies cannot be completely performed just by arresting and convicting offenders.Some convicted offenders may serve their prison terms while some convicted offenders may have their sentences suspended and be given a chance to rehabilitate themselves.In either case,while it is necessary to condemn criminals with deserved punishments,criminals too are members of society thus society needs them to repent from re-offending.Therefore,it also is an important role of criminal justice to maintain public security by providing proper treatment for regeneration and social reintegration of offenders. Of course,there is a long way to go before achieving this goal and efforts should be made by both people who provide treatment programs and offenders themselves.In this respect,a conviction is the starting point of the next phase,"treatment of offenders,"and is merely a passing point within the entire process of criminal justice.Thus,treatment of offenders serves is like a wheel of the criminal justice system while clearance/punishment of offenders is another wheel.We cannot stress its importance enough. (3) Considering the above mentioned importance of treatment of offenders for maintenance of public security,we must include offender treatment issues in order to analyze the ways to restore public security.For instance,overcrowded prison has become a serious problem.However,in order to restore public safety,we need to further clarify how this problematic situation affects particular aspects of inmate treatment and derive appropriate measures. (4) In addition,triggered by the revelation of inmate casualties in Nagoya Prison during2002and2003,various problems in prison management have been pointed out.In this respect,the Minister of Justice organized the Council on Prison Administration Reform to discuss the issue from broad-ranging perspectives with no areas left uncovered.The Council then made a recommendation entitled"Toward Prisons with Public Understanding and Support,"on December22,2003.The recommendation asks for various revisions and reforms throughout prison management from three aspects:(i)promoting true rehabilitation and social reintegration of prisoners while respecting their human dignity,(ii)reducing excess burden on prison officers,and(iii)achieving transparency of the correctional system. Even though the Japanese correctional system is urged to meet these various demands,the legal ground of the system is still the Prison Law,which was enacted in1908.Based on the years of experience in operation and the needs to modernize the correction system,there have been continuous efforts to update the law but such efforts have failed to date.Consequently,the law has become unsuitable for the international principle of prison management and also is unsatisfactory from the criminal justice policy perspective to promote rehabilitation and social reintegration of inmates.The coincidence that the urge to reform the correctional system has emerged as the enforcement of the Prison Law to reach nearly a century,suggests now is the time to review the way of treating offenders. (5) The last phase of the treatment process is probation/parole supervision provided by rehabilitation service.Probation/parole supervision for adults is for parolees and convicted offenders with suspended sentence under the necessary guidance and support for rehabilitation while they are allowed to lead daily lives in society.Japanese probation/parole supervision is unique in that its operation relies upon corroboration of probation officers who are governmental officers with expertise in rehabilitation service and voluntary probation officers who are citizen volunteers.Since more than half a century has elapsed since the current rehabilitation service system was first established after World War II,the rehabilitation service system also faces many issues that need to be discussed. (6) In light of the circumstances mentioned above,the2004White Paper features correction and rehabilitation of adult offenders.In the special article,we discuss the treatment of adult offenders in current high-crime society by comparing it with that of safer society in the past,specify challenges thereof and provide helpful data for future discussion. In the analysis,we select the year1973as the benchmark for comparison with the present.The reason for choosing that year is because the social order in Japan stabilized as post-WWII chaos ceased and the economy started to blossom.The year1973was when the period of high economic growth ended and marked the lowest number after WW II in terms of the number of reported non-traffic Penal Code offenses and the occurrence rate of those offenses(See Fig. 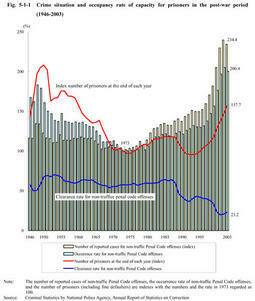 5-1-1 ).In that year,the clearance rate for non-traffic Penal Code offenses was at a high level of57.8%and prisoners'occupancy rate of capacity was82.4%(at the end of1973),far from over-crowding,thus the White Paper on Crime of1973stated"the crime situation is relatively calm. "For these reasons,the year1973,just30years ago from the year2003to be precise,seems to be the best year for comparison.